Juggle - Life is Busy. We Can Help. Families trying to juggle it all. Welcome to the app that’s about to make your life a little easier. The struggle is real, but JUGGLE is the solution! We begin with a stringent recruitment process, creating a pool of energetic, educated and experienced students and recent grads who are a cut above those found on other care websites. Then we set you up with a network of people you are connected to via social media and community filters who have used our app to find trusted sitters, tutors and personal assistants. Add in seamless payment and on-demand services for when you’re in a pickle, and you have the best app to hit your phone since Uber. Life just got a little easier. Four moms. Four busy households. Four lifelong friends who had a problem to solve. JUGGLE has made the task of finding someone to entrust with our children go from impossible and nerve wracking to simple, dependable and always exactly what we are looking for. Other sites have always made me feel uneasy because of the unknown of who will show up at your house; this app creates the perfect network of neighbors and friends using the same group of dependable sitters. I love hearing a sitter tell my children that they know their friends from around the block; it puts us all at ease! We just used JUGGLE for the first time last weekend. It was great, convenient, easy to use and a very good value! We hired one of the girls to help serve, set up and clean up at a birthday party at our home. Taylor showed up in her JUGGLE shirt, was polite and professional, took direction well and allowed my wife and I to enjoy our guests while she took care of all the details that go into hosting a party! We will be using JUGGLE a ton! I highly recommend this service! It’s so easy to book a sitter. With JUGGLE, there is no need to book a sitter weeks in advance. 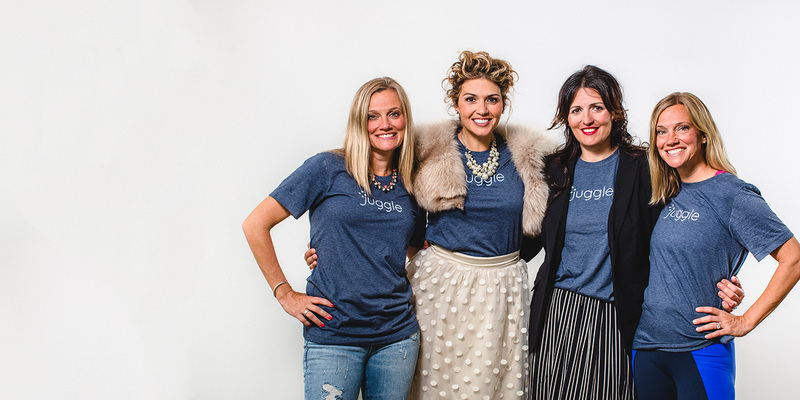 JUGGLE allows parents to find help almost instantly! Are you a college student who wants freedom and flexibility when it comes to employment? Join our SQUAD.